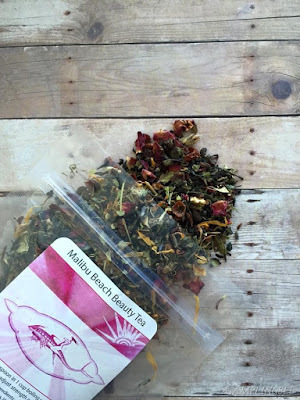 A Sampling Bee: Malibu Beach Beauty Tea Review & Giveaway! Hey! Happy New Year! 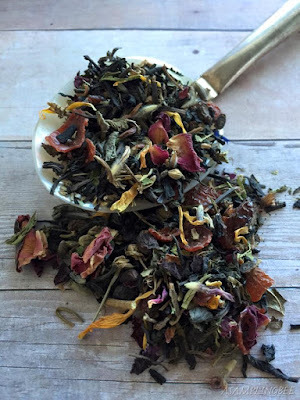 Today, I share with you a tea from Newport Skinny Tea. 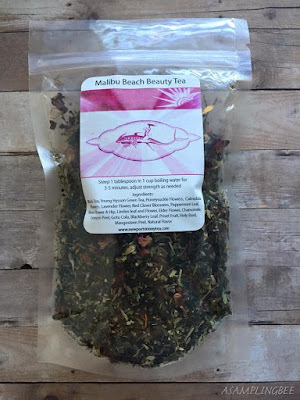 This yummy tea, that I was able to try, is called Malibu Beach Beauty Tea. Newport Skinny Tea is a company that believes that ancient herbs and teas are the most effective, safest way to get to the most vital, beautiful you. Newport Skinny Tea is dedicated to helping you become your authentic, blissful self, whatever that means to YOU! Malibu Beach Beauty Tea helps strengthen collagen production. This tea also helps reduce excess water that is trapped in your tissues as well as reduce cellulite. After brewing your tea, you can use the tea bag to reduce inflammation and redness due to acne. Just place the tea bag on the effected area. Keep away from eyes! Instructions: Steep 1 Tablespoon of tea per 1 cup of boiling water for 3 minutes, adjust strength as needed. Chamomile Flowers: Especially revered for easing digestive woes, and comforting intestines. Lemon Peel & Oil: Since its rich in antioxidants and Vitamin C, it helps improve your digestion and clears the skin. Linden Leaf & Flowers: Helps to renew the skin, It clears mucus from the body and clears the kidneys of excess waste. Privet Fruit(buckthorn): Helps it eliminate all the toxins, mildly laxative. Used to treat all skin conditions. I love the smell and taste of it. It is very lightly sweetened. Which I could do without. I don't mind the Stevia sugar, but I am not crazy about the aftertaste. I think the tea would be better without it. I usually drink my tea unsweetened. Especially if its a detox tea. But, I love this tea. The tea brews nicely. The tea diffuser that I used left a little bit of tea debris at the bottom of my cup so I ran the tea through a coffee filter. It's a tea that I could drink every day. Which I plan on doing. From drinking Malibu Beach Beauty Tea, I've felt less bloated. My acne is clearing up and my skin is softer. 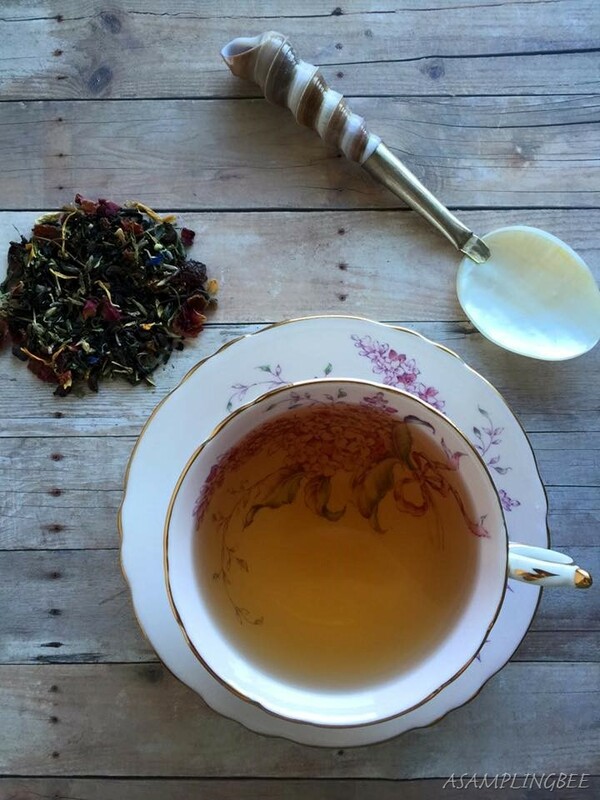 Newport Skinny Tea uses only the best herbs and teas. All of the ingredients are Organic, Preservative Free, Pure and Natural. Get rid of those unwanted Toxins with Newport Skinny Tea! Newport Skinny Tea has a wide range of products. Including a 21 Day Newport Skinny Cocoa Tea, Looking Cute Kit, Mermaid Cove Metabolism Tea and many more. Shop all of their products HERE. *Samples were sent to me for review. All opinions are my own. Always! That tea sounds great! I am a big fan of teas like this and I would love to try this. I drink tea every day, and I am always looking for new stuff. I am going to give this a try. I drink at least a cup everyday, too! Tea is good for you :) Please enter the giveaway! I am more of a tea person, so this is something that works for me. Based from your experience, I think it's awesome and I would love to try it! It's a must-try. Newport Skinny Tea has a large variety of teas. Sounds interesting. I drink tea every morning so I would be nice to incorporate this tea. It looks so nice, I've never seen and try it but I found interesting. This sounds interesting. I need to lose a few more pounds and I would like to try this tea. I love tea as much as I love coffee. This tea looks interesting enough to try. Thanks for letting me know about it. I am not a big fan of Stevia after taste either. I love herbal teas now since coffee has so much acid in it. I love tea. This sounds like it would be a nice cup of tea! I have heard a lot of people say they like Stevia. It would be nice to sweet w/o sugar. Sitting here sipping on my vanilla chai tea I'm thinking this tea sounds great. Sad I missed the giveaway. I really, really love tea. This looks super good. I'm sad that I missed the giveaway! There are sooo many benefits to tea! I definitely want to try this one!